Home » VectorVest » Buy Evraz #EVR says VectorVest. The turnaround over the past year has been nothing short of spectacular. Buy Evraz #EVR says VectorVest. The turnaround over the past year has been nothing short of spectacular. By Alan Green in VectorVest on 6th March 2018 . 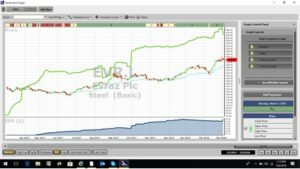 Evraz plc (EVR.L) is a steel, mining and vanadium business with operations in the Russian Federation, Ukraine, the United States, Canada, the Czech Republic, Italy, Kazakhstan and South Africa. The Company’s principal activities include manufacturing steel and steel products; iron ore mining and enrichment; coal mining; manufacturing vanadium products, and trading operations and logistics. Its segments include Steel; Steel, North America; Coal, and Other Operations. The Steel segment is engaged in the production of steel and related products at all mills except for those located in North America. The Steel, North America segment is engaged in the production of steel and related products in the United States and Canada. The Coal segment includes coal mining and enrichment. Other Operations include energy-generating companies, shipping and railway transportation companies. As with so many stocks appearing across VectorVest metrics, the upsurge in production at EVR was identified on the RT (Relative Timing) metric as far back as June last year. RT is a fast, smart, accurate indicator of a stock’s price trend, and despite the near doubling in share price since June last year, EVR still logs a current rating of 1.75 on this metric, which is excellent on a scale of 0.00 – 2.00. Other high scoring metrics include RV (Relative Value) – an indicator of long-term price appreciation potential. Here EVR scores 1.62, which again is excellent on a scale of 0.00 to 2.00. EVR also scores an excellent GRT (Earnings Growth Rate) of 38%, and while the RS (Relative Safety) metric only registers a fair rating of 0.98 (scale of 0.00 to 2.00), trading at 437p the stock is still considerably undervalued against a current VectorVest valuation of 670p per share. The chart of EVR.L is shown below in my normal format. The share is on a Buy recommendation on VectorVest and trending strongly upwards. The blue line study shows Earnings per Share (EPS) which has trebled over the last year. This is the engine that’s driving the share price upwards. Summary: This steel and metals mining & production giant has enjoyed varied fortunes over the past 5 years, while debt concerns and a dip in steel prices in 2015 saw EVR test lows of just 60p. The turnaround over the past year has been nothing short of spectacular, and while the volatile nature of the stock warrants a low RS (Relative Safety) rating, the special dividend and bullish outlook announced by the board ensures a medium term buy rating and thumbs up from VectorVest. Buy.